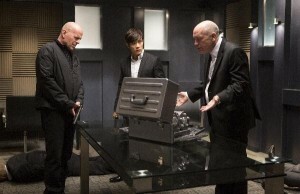 The case in in the hands of Bruce Willis (l.), Hun Lee and John Malkovich in Red 2. Bruce Willis (Looper), Helen Mirren (The Debt), John Malkovich (Secretariat) and Mary Louise Parker (TV’s Weeds) return in Red 2, the inevitable follow-up to the popular, similarly-crimson 2010 action-comedy crime movie Red. On, and this time around, Anthony Hopkins (Hitchcock) and Catherine Zeta-Jones (Lay the Favorite) come along for the ride. retired black-ops CIA agent Frank Moses (Willis) is trying to chill out with his lady (Parker) when he called back into action and reunites his unlikely team of operatives for a global quest to track down a missing, next-generation nuclear device that can change the balance of world power. To get the job done, Moses and co. must their wits and old-school skills to smash an assortment of assassins, terrorists and power-crazed government officials. Released wide in U.S. theaters (and around the world!) in July, 2013, the PG-13 film rang up a modest $54 million at the domestic box office. The critical response was equally tepid, with Rotten Tomatoes reporting that reviewers gave the film (directed by Dean Parisot) a 5.4/10 rating based on 134 published reviews. But the cast is eminently watchable, the first one was fun and we’re thinking there must enjoyment to be had here…!